Before moving or repositioning the server, make sure that you raise all four leveling feet. Note - The leveling feet must remain securely down on the floor at the installation site. Only raise the leveling feet before moving the server. Use a 19-mm wrench to loosen the 19-mm locking nuts located at the top of each leveling foot. Turn the wrench clockwise to loosen the 19-mm locking nuts. 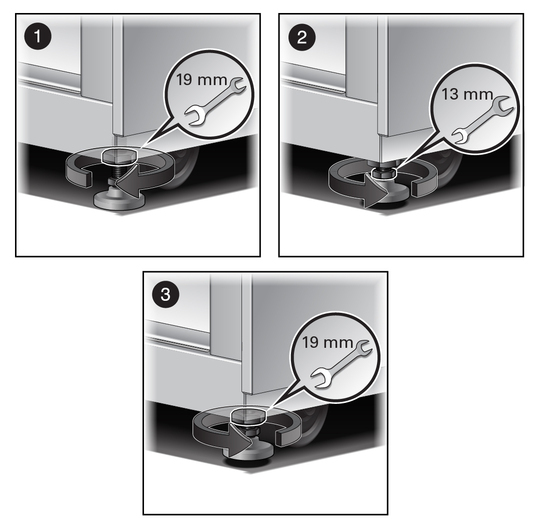 Use a 13-mm wrench to raise each leveling foot. Turn the wrench counter-clockwise to raise the leveling feet up to the bottom of the server. After raising each leveling foot, use a 19-mm wrench to secure the 19-mm locking nuts to the server. Turn the wrench counter-clockwise to secure the locking nuts. When tightened, these locking nuts prevent the leveling feet from being raised or lowered.